For small groups traveling short distances, we recommend a modern, reliable 18-passenger minibus. Transport event attendees to and from your venue, or take a ride to Phoenix’s top nightclubs for a birthday or bachelorette party. Either way, you’ll ride comfortably and safely with friends and family. Each bus comes with a knowledgeable driver who will handle all navigation and parking. We only work with experienced drivers who meet our high standards of customer service and professionalism, so you’re in good hands when you partner with Phoenix Charter Bus Company. Call our friendly reservation specialists today at 480-445-9823 for a personalized quote on your upcoming trip! We’re available 24/7 to help you book transportation for your Phoenix wedding, corporate conference, sporting event, and more. The smallest of our minibus options, this compact motorcoach is perfect for quick transportation across short distances. The 18-passenger model is well-suited for exploring Phoenix or a nearby city. Establish a shuttle service for your small group, and let a professional driver handle the logistics! Book a 20-passenger minibus to streamline your small- or medium-sized group travels across Phoenix! An affordable and efficient transportation option, this minibus is perfect for event shuttles, tour groups, or other short-term travel solutions. With many of the same amenities as a full-sized model, your passengers are sure to arrive in comfort. The largest minibus model is perfect for medium-sized groups who don’t want to separate themselves into multiple cars. Its compact size allows your group to zip through traffic, while the spacious interior comfortably accommodates everyone. Travel throughout Phoenix with ease, whether you’re headed to a sporting event, field trip, or other outing. Do you need a ride for your large group or for travel over long distances? Consider this 56-passenger model your go-to. This charter bus boasts an array of amenities, from WiFi and power outlets to reclining seats and extra storage space, many of which are available at no additional cost. 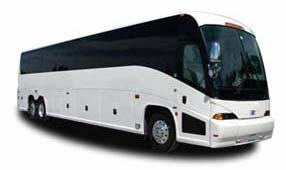 Ensure everyone’s comfort in this modern and roomy motorcoach.